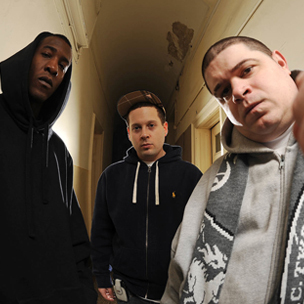 Vinnie Paz Of Jedi Mind Tricks Recalls Recording "Violent By Design"
For many Hip Hop heads, Jedi Mind Tricks’ 2000 album Violent By Design is one of the crowning achievments of the then-burgeoning underground scene. Now, in a recent interview with Unkut, JMT frontman Vinnie Paz recalls the recording of the group’s seminal sophomore release. Paz recalled the lo-fi ethis and extremely limited budget on which he, producer Stoupe the Enemy of Mankind and fellow emcee Jus Allah record the LP. He expalined that they actually recording the entire LP in Stoupe’s bedroom, which lacked any form of sound proofing, let alone a mic booth.